Hugely enjoyable, feel-good social comedy that shines a much needed spotlight on an unsung true story, with a strong script, impeccable production design and terrific performances from a superb ensemble cast. 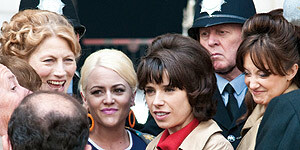 Directed by Nigel Cole (Calendar Girls) and based on a true story, Made In Dagenham is set in 1968 and stars Sally Hawkins as Rita O'Grady, a married mother of two who works as a machinist at Dagenham's Ford motor plant. After staging a successful one day strike when the plant attempts to classify her co-workers as 'unskilled labour', Rita persuades the entire female workforce to strike over equal pay, eventually marching on Westminster and attracting the attention of fiery Labour Minister Barbara Castle (Miranda Richardson). However, the pressures of the strike begin to take their toll on the women's lives, especially when the plant starts laying off male workers. Meanwhile, wily manager Robert Tooley (Richard Schiff) arrives from America with instructions to undermine the strike by any means necessary. Sally Hawkins is a hugely likeable actress and she's perfectly cast as Rita, a shy, quiet woman who gradually discovers the strength and passion of her own voice, to the point where she might as well be wearing a t-shirt with the phrase 'The Mouse That Roared' written on it. There's also terrific support from a superb ensemble cast that includes Jaime Winstone (as Twiggy-obsessed Sandra), Andrea Riseborough (as party girl Brenda), Rosamund Pike (as the posh wife of a Ford manager who becomes an unexpected ally), Miranda Richardson (wonderful, as always) and Bob Hoskins as kindly union rep Albert. The detailed production design is impeccable throughout, though the soundtrack choices are less than inspired by comparison. The film also makes strong use of colour and there are some striking and unusual images, such as the women all bicycling in to work or stripping down to their underwear to work in the sweltering heat of the shop floor. Aside from shining a much needed light on a hitherto unsung true story, the script is packed with wonderful scenes and is often very funny. There are also several quietly moving moments, such as a wonderful exchange between Rita and her exasperated husband (Danny Mays) or the scene where Pike's character visits Rita at home. Made in Dagenham is a hugely entertaining, brilliantly acted comedy that's genuinely uplifting, emotionally moving and laugh-out-loud funny. Highly recommended.